2. a stitch or series of stitches made to secure apposition of the edges of a surgical or traumatic wound; used also as a verb to indicate application of such stitches. 3. material used in closing a wound with stitches. adj., adj su´tural. 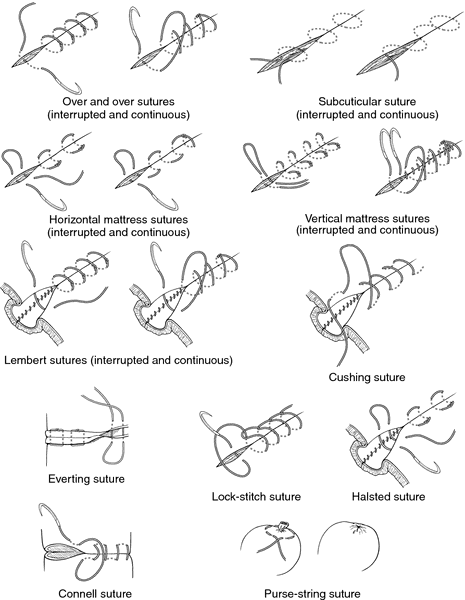 Various types of sutures. From Dorland's, 2000.
absorbable suture a strand of material that is used for closing wounds and becomes dissolved in the body fluids and disappears; types include surgical gut, tendon, and some synthetics. apposition suture a superficial suture used for exact approximation of the cutaneous edges of a wound. approximation suture a deep suture for securing apposition of the deep tissue of a wound. buried suture one placed within the tissues and concealed by the skin. catgut suture an absorbable suture made from surgical gut. collagen suture a suture made from the tendons of cattle, chemically treated, purified, and processed into strands; it is most often used in ophthalmologic surgery. continuous suture one in which a continuous, uninterrupted length of material is used. coronal suture the line of union between the frontal bone and the parietal bones. cranial suture the lines of junction between the bones of the skull. 1. an intestinal suture in which the thread is passed through the mucous membrane only. 2. union of a ruptured tendon by splitting one of the ends and suturing the other end into the slit. Czerny-Lembert suture a combination of the Czerny and the Lembert sutures. double-armed suture one made with suture material threaded through a needle at each end. Called also cobbler's suture. false suture a line of junction between apposed surfaces without fibrous union of the bones. Gély's suture a continuous stitch for wounds of the intestine, made with a thread having a needle at each end. interrupted suture one in which each stitch is made with a separate piece of material. lambdoid suture the line of union between the upper borders of the occipital and parietal bones, shaped like the Greek letter lambda. Lembert suture an inverting suture used in gastrointestinal surgery. lock-stitch suture a continuous hemostatic suture used in intestinal surgery, in which the needle is, after each stitch, passed through the loop of the preceding stitch. mattress suture suturing with the stitches parallel to the wound edges (horizontal mattress suture) or at right angles to them (vertical mattress suture). purse-string suture a type of suture commonly used to bury the stump of the appendix, a continuous running suture being placed about the opening, and then drawn tight. relaxation suture any suture so formed that it may be loosened to relieve tension as necessary. retention suture a reinforcing suture made of exceptionally strong material such as wire, and including large amounts of tissue in each stitch. Used to relieve pressure on the primary suture line and to decrease the potential for wound dehiscence. sagittal suture the line of union of the two parietal bones, dividing the skull anteroposteriorly into two symmetrical halves. squamous suture the suture between the pars squamosa of the temporal bone and parietal bone. 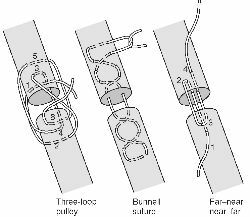 subcuticular suture a method of skin closure involving placement of stitches in the subcuticular tissues parallel with the line of the wound. synthetic absorbable suture an absorbable suture produced from strands of polymers; the most commonly used materials are polyglactin 910 (Vicryl) and polyglycolic acid (Dexon); the latter is more rapidly absorbed. Synthetic absorbable sutures are absorbed by slow hydrolysis, a chemical process in which the polymer reacts with tissue fluids, causing a breakdown of the molecular structure of the material at a predictable rate and with minimal tissue reaction. vertical mattress suture a suture whose stitches are at right angles to the edges of the wound, taking both deep and superficial bites of tissue; the superficial ones achieve more exact apposition of the cutaneous margins. When the suture material is pulled tight, the wound edges evert. (sū'chūr), This word refers to a seam consisting of several stitches. It is not properly synonymous with stitch. 3. The material (silk thread, wire, synthetic material, etc.) with which two surfaces are kept in apposition. 4. The seam so formed, a surgical suture. 2. a stitch or series of stitches made to secure apposition of the edges of a surgical or traumatic wound. 3. to apply such stitches. absorbable suture a strand of material used for closing wounds which is subsequently dissolved by the tissue fluids. buried suture one placed deep in the tissues and concealed by the skin. catgut suture see surgical gut, under gut. cobblers' suture one made with suture material threaded through a needle at each end. coronal suture the line of junction of the frontal bone with the two parietal bones. cranial sutures the lines of junction between the bones of the skull. figure-of-eight suture one in which the threads follow the contours of the figure 8. Halsted suture a modification of the Lembert suture. mattress suture a method in which the stitches are parallel with (horizontal mattress s.) or at right angles to (vertical mattress s.) the wound edges. nonabsorbable suture suture material which is not absorbed in the body. purse-string suture a continuous, circular inverting suture, such as is used to bury the stump of the appendix. 1 n, a border or a joint, such as between the bones of the cranium. 2 v, to stitch together cut or torn edges of tissue with suture material. 3 n, a surgical stitch taken to repair an incision, tear, or wound. 4 n, material used for surgical stitches, such as absorbable or nonabsorbable silk, catgut, wire, or synthetic material. noun Surgery A material–eg, wire, thread–used to hold tissues in apposition. See Biosyn™ suture, Knotless anchor suture, Linatrix suture, Safil® synthetic absorbable surgical suture, Synthetic absorbable suture, Synthetic nonabsorbable suture. Cf Stable verb To join tissues by sewing. 1. A form of fibrous joint in which two bones formed in membrane are united by a fibrous membrane continuous with the periosteum. 2. To unite two surfaces by sewing. 3. The material (silk thread, wire, catgut) with which two surfaces are kept in apposition. 4. The seam so formed; a surgical suture. 1. A length of thread-like material used for surgical sewing or the product of surgical sewing. Sutures are made of many materials including catgut, collagen, linen, silk, nylon, polypropylene, polyester, human FASCIA LATA and stainless steel, and are available in a wide range of thicknesses. Many are provided with a suitable needle swaged on to one or both ends. See also SUTURING. 2. A fixed joint between bones of the vault of the skull. (in surgery) a thread or wire used to join together a wound. (in surgery) the seam found after stitching two parts together. an immovable joint between the bones of the skull. (in plants) the line of fusion between two carpels. 1. Fibrous joint in which two bones formed in membrane are united by a fibrous membrane continuous with periosteum. 3. The material (e.g., silk thread, wire, synthetic material) with which two surfaces are kept in apposition. n 1. a synarthrosis between two bones formed in a membrane, the uniting medium (which tends to disappear eventually) being a fibrous membrane continuous with the periosteum. 2. a surgical stitch or seam. 3. the material with which body structures are sewn, as after an operation or injury. v 4. to sew up a wound. n a suture that becomes dissolved in body fluids and disappears (e.g., catgut). n a suture made to bring about apposition of the deeper tissues of an incision or laceration. n a suture passed through buttonlike disks on the skin to prevent the suture cutting the soft tissue. n a chromatized sheepgut suture. n a suture completely surrounding the tooth; generally used to suspend or retain a flap. n a suture in which an uninterrupted length of suture material is used to close an incision or laceration. n the line along which bones of the cranium or face articulate in an immovable articulation. n most lateral point of the suture between the frontal and zygoma (zygomatic bones). n a suture that joins two sides of the gingiva by passing between the teeth. n individual stitches, each tied separately. n the tiny fastening used to hold a suture in place firmly but not too tightly. The specific type is dictated by procedure, incision location, and tension required to close the wound. n a continuous suture that is applied back and forth through the tissues in the same vertical plane but at a different depth, or in the same horizontal plane but at the same depth. n the line of fusion of the two maxillae (two palatine processes), starting between the central incisors and extending posteriorly across the palate, separating the horizontal plates of the palatine bones into two nearly equal parts. n refers to the single-strand composition of the material used to secure surgical stitches. n refers to the multiple-strand composition of the material used to secure surgical stitches. n a type of organic material used to secure surgical stitches that may react adversely with body tissue. n a suturing needle with three cutting edges, one on either side and a third located on the inside curve. n a suture that does not dissolve in body fluids (e.g., silk, tantalum, nylon). n a horizontal mattress suture used generally about an implant cervix. n a continuous surgical suture for depression of the tongue and retention and holding of the lingual flap out of the field of operation during the surgical impression. n a type of surgical stitching used when the flap being repaired is open on the lingual or facial side; surrounds the tooth by passing between the surrounding teeth and gum tissue. The stitch is adjustable and allows for adjustment of the flap for proper healing. n new technology in surgical stitches developed to counteract the unreliable absorption rates and tissue sensitivity associated with natural stitches. 1. the line of union of adjoining bones of the skull. See also sutura. 2. the linear union of fibers from the equator of the lens, meeting on the anterior and posterior surfaces. May be the location of metabolic cataracts. 3. a stitch or series of stitches made to secure apposition of the edges of a surgical or traumatic wound (see suture pattern below); used also as a verb to indicate application of such stitches. 4. material used in closing a wound with stitches. a strand of organic or synthetic material used for closing wounds, which becomes dissolved in the body fluids and disappears, such as catgut and tendon or polydioxanone. a superficial suture used for exact approximation of the cutaneous edges of a wound. a deep suture for securing apposition of the deep tissue of a wound. thin filaments braided into a single suture; has the virtues of strength, flexibility, ease of handling and good knot security. one placed deep in the tissues and concealed by the skin. a method of securing a thoracostomy tube to the thoracic wall in which the suture is placed deeply into the skin and underlying tissue and the ends are wrapped around the protruding tube in a spiral pattern ('Chinese finger cuff') and tied. one applied around the circumference of a hollow viscus to close it, or to a portion of the wall to bring about inversion of the wall. one made with suture material threaded through a needle at each end. one in which a continuous, uninterrupted length of material is used. Called also whip stitch. the line of union between the frontal bone and the parietal bones. a multifilament suture used mainly for closure of skin. the lines of junction between the bones of the skull. a line of junction between apposed surfaces without a serrated union of the bones. used on tendons, the first bite is made farthest from the severed end, across the gap and emerging close to the severed edge of the distal end. 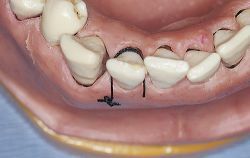 The second bite is close to the end of the proximal segment, crosses the gap and emerges farther from the end of the distal segment. a row of surgical pins are placed through both edges of the wound and suture material is wound back and forth around each pin, as with a shoelace. one in which each stitch is made with a separate piece of material. one placed in the lower dermis; a buried suture. May be interrupted or continuous. one totally within the substance of the skin, not emerging externally and not into the subcutaneous tissues. See also intradermal suture (above). one that turns the edges of the incision inward so the exposed surfaces, usually serosa, contact each other and the edges of the incision are buried. Used in closure of hollow viscera such as the stomach, uterus, intestine or visceral stumps. Includes the Connell, Cushing, Halsted, Lembert and Parker-Kerr suture patterns. the line of union between the upper borders of the occipital and parietal bones, shaped like the Greek letter lambda; called also sutura lambdoides. a tension suture used for apposition of severed tendon ends. an uncoated polyester suture material. stainless steel is used universally. There are also special metal devices including Michel clips and skin staples and staples for intestinal repair. includes silk, steel, polyester, polymerized caprolactam, polypropylene, polyethylene, nylon and cotton. may be braided or monofilament. the placement of suture material, usually designed to achieve a particular purpose in relation to the tissue, organ or surgical procedure being performed, e.g. inversion or eversion of wound edges, relief of tension on the wound, or cosmetic results. sharp-pointed pins that can be pushed through tissue, e.g. vulval lips, and secured at both ends by knobs so that they stay in situ. a type of suture commonly used to bury the stump of the appendix, a continuous running suture being placed about the opening, and then drawn tight. any suture so formed that it may be loosened to relieve tension as necessary. used in the replacement of vaginal and uterine prolapse in cattle. Usually thick, heavy suture material, sometimes tape, is placed through adjacent tissues. used for tension relief, it consists of surgical pins placed through both sides of the wound and suture material wound around the protruding ends and across the incision. used in the surgical correction of patent ductus arteriosus, particularly in small dogs, to ensure that any slippage of ligatures or tissue will not result in excessive blood loss before being controlled by other means. the line of union of the two parietal bones, dividing the skull anteroposteriorly into two symmetrical halves; called also sutura sagittalis. 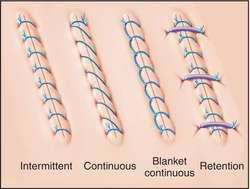 braided silk is used as a nonabsorbable suture. It may be coated with wax or silicone to reduce its absorption of fluids. Its great advantages are its ease of handling and good knot-holding quality. a suture where the uniting bones overlap such as the suture between the pars squamosa of the temporal bone and parietal bone. a tension suture for closing wounds created by placing a roll of bandage along the line of incision and tying the sutures over the top of it. a method of skin closure involving placement of stitches in the subcuticular tissues parallel with the line of the wound. one placed to relieve tension on the incision; may be the same suture pattern that closes the incision or a separate suture or line of sutures of a different pattern. a complicated suture pattern used on tendons. a pattern of interrupted sutures used in closing large skin wounds. Each suture is placed first in the deep dermis and then into the deeper tissues, usually fascia, at a point closer to the center of the wound. The effect is to move the skin closer to the closing position with each suture, obliterate dead space, and relieve tension on the sutures eventually placed to close the wound edges. stainless steel wire used as suture material as monofilament or braided. Problems are kinking, bulk knots, tearing of tissues and the need for special cutting instruments. a technique used for tension support. The stitches are placed with a cannula and ends are rolled instead of being tied. The absorbable suture offerings include a variety of synthetic sutures as well as Surgical Cut Sutures, which are available in either plain or chromic configurations, the chromic gut having been processed to provide a greater resistance to absorption. of the University Hospital of North Staffordshire, in England, found that women stitched with synthetic sutures had less pain in the three days after giving birth, and took fewer painkillers over the next 10 days. When Kettle and colleagues compared standard synthetic sutures to a rapidly absorbing synthetic stitch, they found that a physician or midwife needed to remove standard sutures more often. Wound closure includes the world's largest portfolio of synthetic sutures, PLUS Coated Antibacterial sutures and Dermabond Topical Skin Adhesive. The incidence of one of these complications--suture-line granuloma--has decreased since the use of absorbable synthetic sutures (e.
Absorbable synthetic sutures are best for primary repairs, according to a Cochrane Review of 12 randomized controlled trials involving more than 5,500 women. For maintaining revenue flow, participants have pinned their hopes on absorbable synthetic sutures and skin adhesives segments that are currently witnessing a brisk pace of R&D activities and technological advancements. Supply of surgical suture to the needs COZL - 4 jobsTask 1 - Absorbable SuturesTask 2 - Non-absorbable suturesTask 3 - absorbed surgical sutures and nonabsorbable and specialized kits SuturingTask 4 - Absorbed wound closure systems and absorbed synthetic sutures.